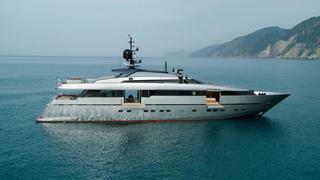 Sanlorenzo Americas reports that it has listed the 40m motor yacht Princess Claudia II for sale. The all-aluminium Sanlorenzo 40 Alloy yacht was built in 2010 and offers a combination of comfort and high-speed. Powered by twin MTU engines, she offers a cruising speed of 26 knots and a maximum speed of 28 knots. The master suite and main salon feature folding hydraulic terraces that extend past the side decks, giving an uninterrupted view of the surroundings. Accommodation is for 10 guests and six crew. A Novurania EQ500 Tender and Yamaha three-person Jet Ski are included. Lying in Fort Lauderdale, Florida, Princess Claudia II is asking $17,549,000.